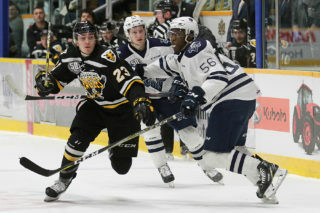 The Screaming Eagles ended November by ending the ten game winning streak of the Rouyn-Noranda Huskies. A third period goal by Leon Gawanke was the difference for the Eagles in a 3-2 victory over the league leaders. The ice appeared to be tilted as all five goals were scored by the team skating in the same direction. The opening period belonged to the Screaming Eagles. The pace of the opening 20 minutes were quick, and while the shots were tied at 15 a piece at the first buzzer, the majority of the quality chances belonged to the home side. At the 11:02 mark Gabriel Proulx found the breakthrough for the Eagles when he ripped a shot low on the blocker side past Samuel Harvey to make it 1-0. The lead would double courtesy of Ian Smallwood who found himself in front of the net. He put the puck through a screen and through the legs of Samuel Harvey and the period finished 2-0. The intermission seemed to refresh the Huskies and they would score early in the middle frame. 55 seconds in, Peter Abbandonato was parked at the side of the net and tapped in a cross crease pass from Jakub Lauko to get the visitors on the board. Rouyn-Noranda would tie the game when the Eagles got into penalty trouble a few minutes later. 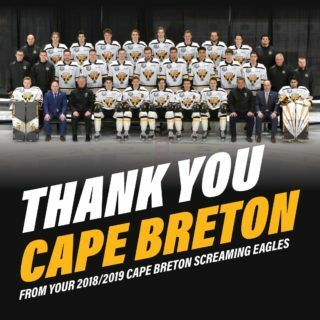 Cape Breton killed off their first penalty of the game, to Ian Smallwood, but Gawanke was whistled for another minor 41 seconds later and the Huskies found the game tying goal on a power play marker by Tyler Hinam. On another Huskies power play later in the period, it was almost the Eagles pulling into the lead, but Mitchell Balmas was denied on a short handed breakway. 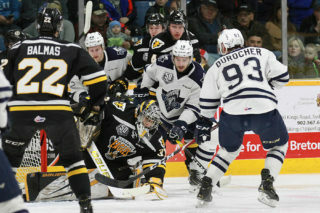 Rouyn-Noranda also had a prime opportunity to pull ahead in the second stanza but Kevin Mandolese denied Alex Beaucage with a highlight reel glove stop. Past the 13 minute mark of the final frame, the Eagles would find a way to push past the Huskies once more. Gawanke had the puck in front of the net and fired a shot that went high up into the air. 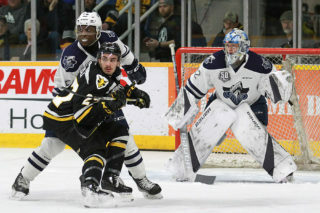 With no one able to track the puck, Rouyn-Noranda goaltender Samuel Harvey swatted at it but was unable to prevent it from falling into the net. A 3-2 lead was nearly a 4-2 lead as about two minutes later Olivier Bourret would earn a breakway but Harvey denied the Eagles forward. Down a goal, Rouyn-Noranda coach Mario Pouliot elected to lift Harvey for an extra attacker with just under two minutes left. But the Huskies would only manage one shot on goal with six attackers and the Eagles would hold on to top the league’s top club. Mandolese turned aside 35 of 37 shots in the victory. Harvey stopped 24 of 27 shots in taking the loss. Screaming Eagles defenseman Kyle Havlena returned to the lineup after missing two games with a minor injury. He registered 4 hits and was +1 in his return to action.